The Congo River (in the past also known as the Zaire River) is a river in Africa, and is the deepest river in the world, with measured depths in excess of 220 m (720 ft). It is the third largest river in the world by volume of water discharged. Additionally, its overall length of 4,700 km (2,920 mi) makes it the ninth longest river. The Congo gets its name from the ancient Kingdom of Kongo which inhabited the lands at the mouth of the river. The Democratic Republic of the Congo and the Republic of the Congo, both countries lying along the river's banks, are named after it. Between 1971 and 1997 the government of then-Zaire called it the Zaire River. The Congo's drainage basin covers 4,014,500 square kilometres (1,550,000 sq mi). The Congo's discharge at its mouth ranges from 23,000 cubic metres per second (810,000 cu ft/s) to 75,000 cubic metres per second (2,600,000 cu ft/s), with an average of 41,000 cubic metres per second (1,400,000 cu ft/s). The river and its tributaries flow through the Congo rainforest, the second largest rain forest area in the world, second only to the Amazon Rainforest in South America. The river also has the second-largest flow in the world, behind the Amazon; the third-largest drainage basin of any river, behind the Amazon and Río de la Plata rivers; and is one of the deepest rivers in the world, at depths greater than 220 m (720 ft). Because its drainage basin includes areas both North and South of the equator, its flow is stable, as there is always at least one part of the river experiencing a rainy season. The sources of the Congo are in the highlands and mountains of the East African Rift, as well as Lake Tanganyika and Lake Mweru, which feed the Lualaba River, which then becomes the Congo below Boyoma Falls. The Chambeshi River in Zambia is generally taken as the source of the Congo in line with the accepted practice worldwide of using the longest tributary, as with the Nile River. The Congo River formed 1.5-2 million years BP during the Pleistocene. The Congo's formation may have led to the allopatric speciation of the bonobo and the common chimpanzee from their most recent common ancestor. The bonobo is endemic to the humid forests in the region, as are other iconic species like the Allen's swamp monkey, dryas monkey, aquatic genet, okapi and Congo Peafowl. In terms of aquatic life, the Congo River Basin has a very high species richness, and among the highest known concentrations of endemics. Until now, almost 700 fish species have been recorded from the Congo River Basin, and large sections remain virtually unstudied. Due to this and the great ecological differences between the regions in the basin, it is often divided into multiple ecoregions (instead of treating it as a single ecoregion). Among these ecoregions, the Lower Congo Rapids alone has more than 300 fish species, including approximately 80 endemics while the southwestern part (Kasai Basin) alone has about 200 fish species, of which about a quarter are endemic. The dominant fish families–at least in parts of the river–are Cyprinidae (carp/cyprinids, such as Labeo simpsoni), Mormyridae (elephantfishes), Alestidae (African tetras), Mochokidae (squeaker catfishes), and Cichlidae (cichlids). Among the natives in the river is the huge, highly carnivorous giant tigerfish. Two of the more unusual endemic cichlids are the whitish (non-pigmented) and blind Lamprologus lethops, which is believed to live as deep as 160 metres (520 ft) below the surface, and Heterochromis multidens, which appears to be more closely related to cichlids of the Americas than other African cichlid. There are also numerous endemic frogs and snails. Several hydroelectric dams are planned on the river, and these may lead to the extinction of many of the endemics. Several species of turtles, and the slender-snouted, Nile and dwarf crocodile are native to the Congo River Basin. The Congo River is the most powerful river in Africa. During the rainy season over 50,000 cubic meters (1,800,000 cu ft) of water per second flow into the Atlantic Ocean. Opportunities for the Congo River and its tributaries to generate hydropower are therefore enormous. Scientists have calculated that the entire Congo Basin accounts for thirteen percent of global hydropower potential. This would provide sufficient power for all of sub-Saharan Africa's electricity needs. Currently there are about forty hydropower plants in the Congo Basin. The largest is the spectacular Inga Falls dam, about 200 km (120 mi) southwest of Kinshasa. The prestigious Inga Project was launched in the early 1970's and at that time the first dam was completed. The plan as originally conceived called for the construction of five dams that would have had a total generating capacity of 34,500 megawatts. To date only two dams have been built, which are the Inga I and Inga II, with a total of fourteen turbines. Here's the our members favorite photos of "Rivers in Angola". 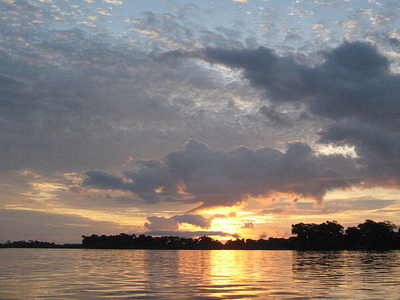 Upload your photo of Congo River! Get in touch with 1 Touristlink members who want to visit Congo River or with Footsteptrails and Manasse Shabani who already have been here.